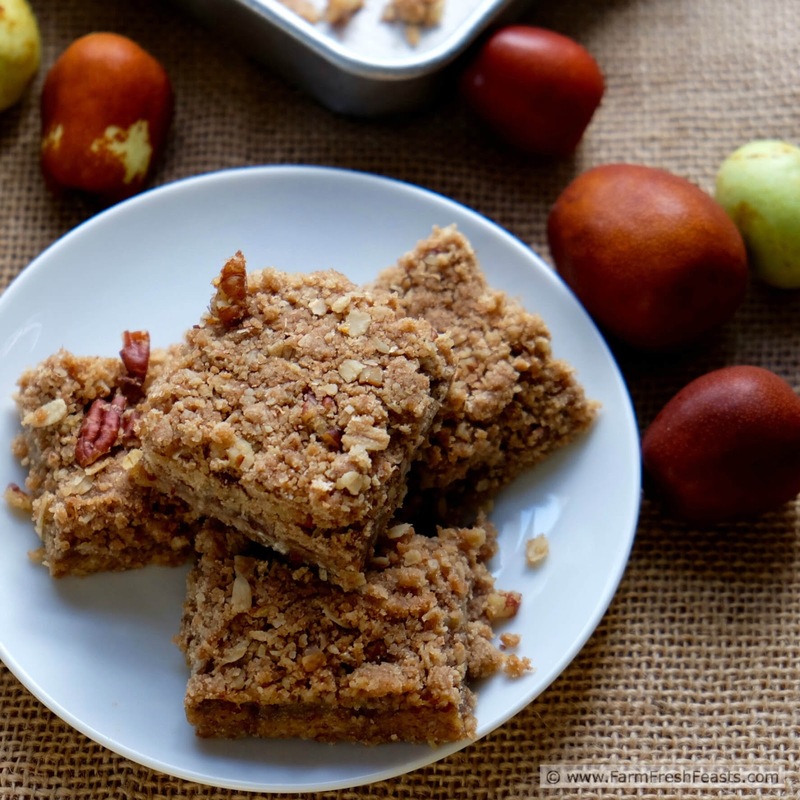 Jujube fruit simmered with apple cider to make a fruit butter, sandwiched between layers of pecan oatmeal bar cookie in a fruit dessert from the farmer to you via Barn2Door. Have you ever eaten a jujube fruit? There are more than a dozen people in SW Ohio who can now say 'yes, I have, they're yummy' because of these bars. Jujubes taste like a crunchy apple-pear, and they have a pit similar to a date. 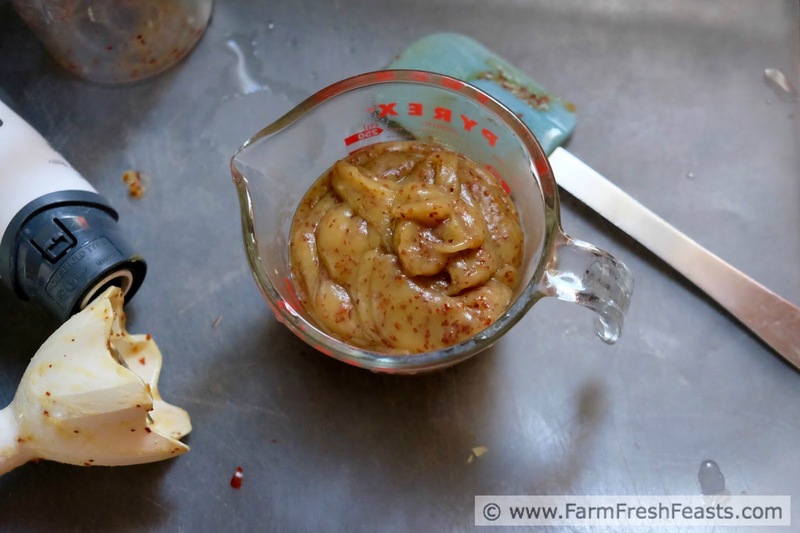 Disclosure: this recipe and my previous one used jujube fruits grown by Fairview Orchards that I received from Barn2Door in exchange for a post. Because I believe in buying directly from farmers who choose to grow food in sustainable ways, I am glad to spread the word about this platform, and I was delighted to share the last of the fruits and these bars with our Community Supported Agriculture (CSA) farmers to close the circle. 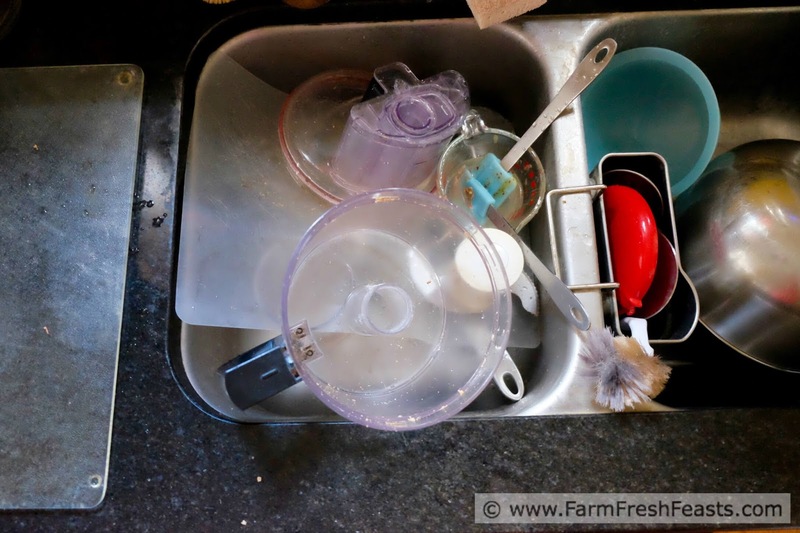 In my last post I marveled over the ability for me, in an area not known for local foodies, to source exotic produce direct from the farmer to concoct my Jujube Fruit and King Oyster Mushroom Sauté. Today I'm going to tell you a bit more about Barn2Door's mission, and share another recipe I made--Jujube Butter Oatmeal Bars. [Of course you can just eat the fruit out of hand, like we did when I opened the box, but one of the purposes of my blog is to provide recipe inspiration for farm share ingredients, so I wanted to play some more.] Check out Barn2Door and subscribe to the newsletter. You can find them on Facebook, Twitter, Instagram, Google+, and Pinterest. 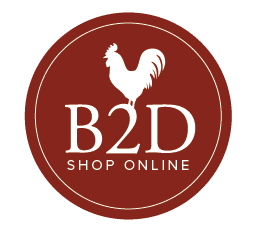 While it would simplify things to say Barn2Door is an online farmer's market, it's a bit more than that. Barn2Door is a marketplace where you can buy sustainably grown meat, fish, fruits, vegetables & items like raw honey and real maple syrup right from producers and growers. Farmers, fishers, ranchers and gardeners have their own store - like Etsy for farms - where they showcase the food they have for sale, and manage direct communications, sales and fulfillment (local delivery, national shipping or both!). I like the idea of giving producers a platform to sell their products to a wider audience than the folks who make it out to the local farmer's market each week. I am a fan of supporting folks who choose to grow food in sustainable ways, so a platform that takes much of the effort out of creating an online presence--enabling the farmers to continue doing what they do best (grow my food) gets my tail wagging like Robert Barker's. [If I had the skillz to make a gif of his tail zooming side to side and then circling to the left and then back to side to side, I would. Dog has talent.] 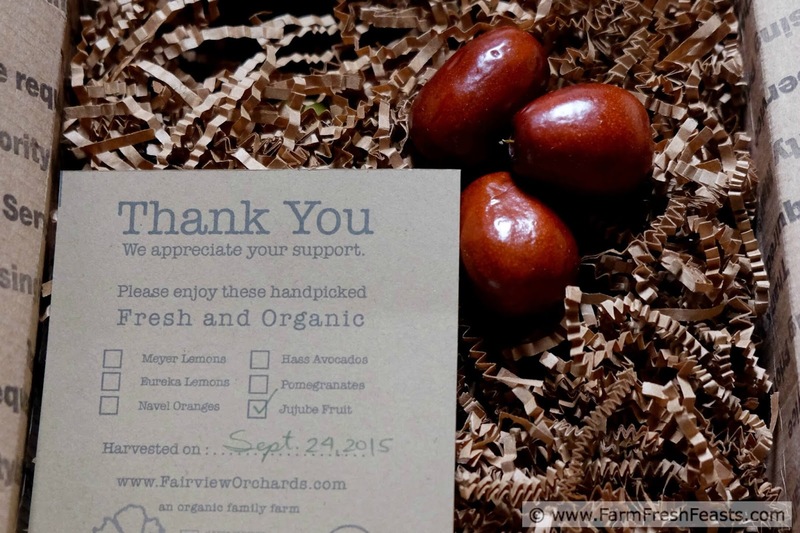 I typed in my zip code and was impressed with the variety of products I could have delivered to me from Fairview Orchards and other producers. 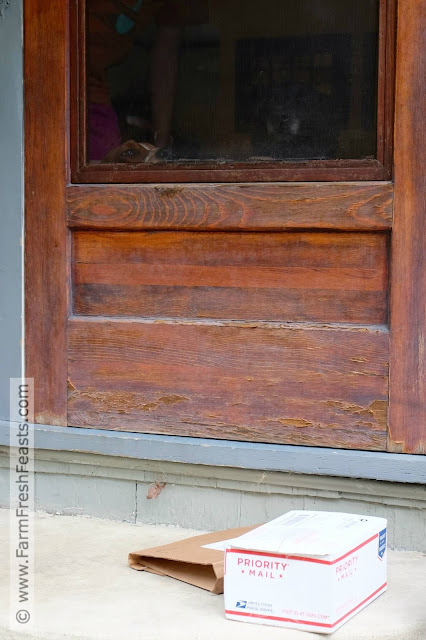 While I will continue to source my local Ohio maple syrup and local Ohio honey from my farmer's market, if you don't have access to your local producers you can get Vermont maple syrup delivered to your door. How cool is that? "Fairview Orchards is a family owned & operated farm that cultivates a diverse variety of certified organic fruit such as Hass Avocados, Meyer Lemons, Blood Oranges, Figs, Specialty Tangerines, Jujubes & Pomegranates. Hand-picked and delivered or shipped fresh, we practice both traditional and sustainable farming methods while utilizing the latest technologies. Our farm is 100% powered by solar energy and is nestled in Ojai, California surrounded by rolling hills and the Topa Topa mountains. We are fortunate to have naturally rich soil and a great micro-climate that our trees and plants love." One more thing I want to share before I get to the recipe--Barn2Door has a newsletter where you can sign up to stay in touch. Click here to sign up. You won't miss out on the latest news, promotions(! ), new farmers, and of course seasonal food. 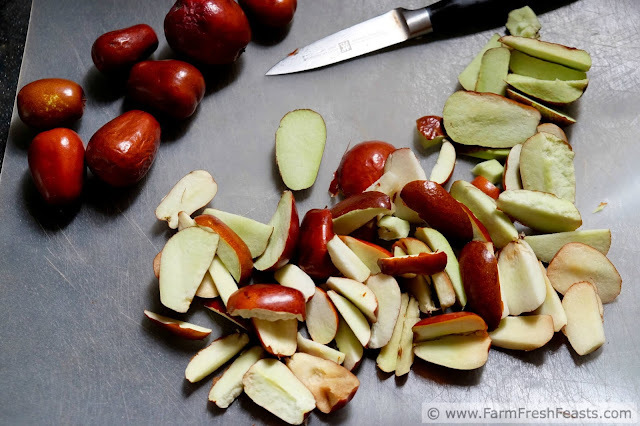 For more recipes using Jujube fruits, I'll have to add a category to my Visual Recipe Index by Ingredient, a resource for folks like me eating direct from the farmer. Check out more on Pinterest and Facebook. Want to know how to use this blog? Click here. Recipe notes: I like a dense bar cookie, and I don't like to have tempting sweets lying around the house, so I typically make my bar cookies in a 9 inch square pan. If you prefer a crispier bar cookie, please use the same amounts, but spread across a 9x13 inch pan for a thinner bar cookie. I prefer metal pans because they make a nicely browned bottom crust. 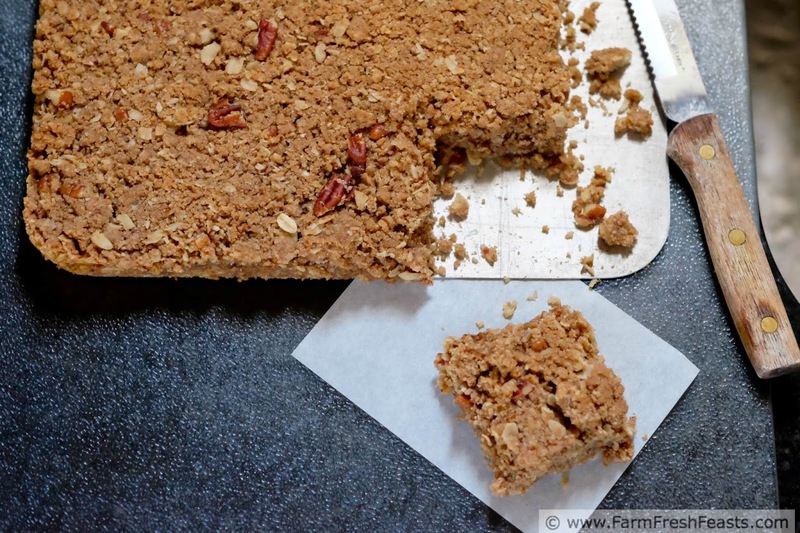 Another reason I use my 9 inch square pan is because the bottom lifts out, but lining your pan with parchment paper would do the same thing and make these bars easier to remove. 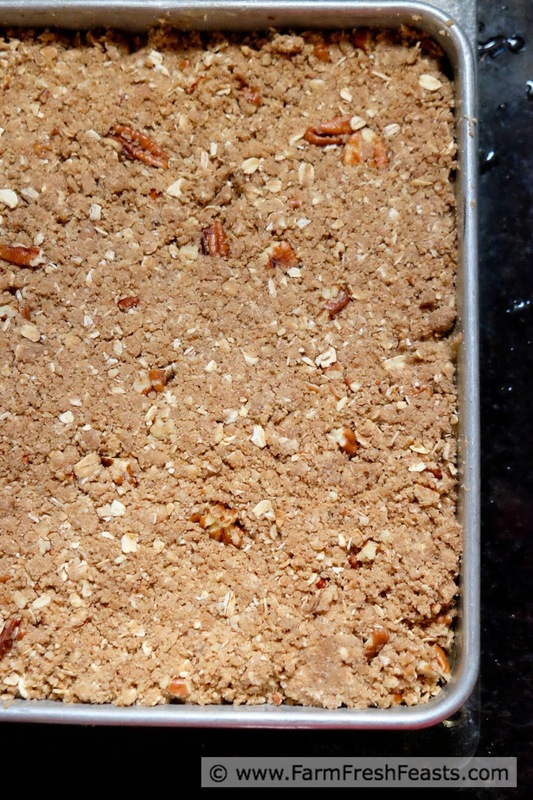 Do chill them after they are cool and before you cut them--they will be less crumbly that way. 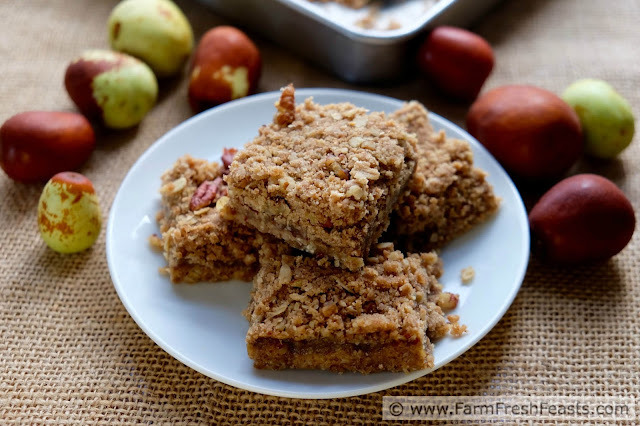 The crust recipe was slightly adapted from the Little St Simons Apricot Oatmeal Bars recipe in Anne Byrn Saves the Day! Cookbook (Amazon affiliate link) . Crumbly--because I didn't chill these first. In a medium saucepan combine jujubes and apple cider over medium heat. 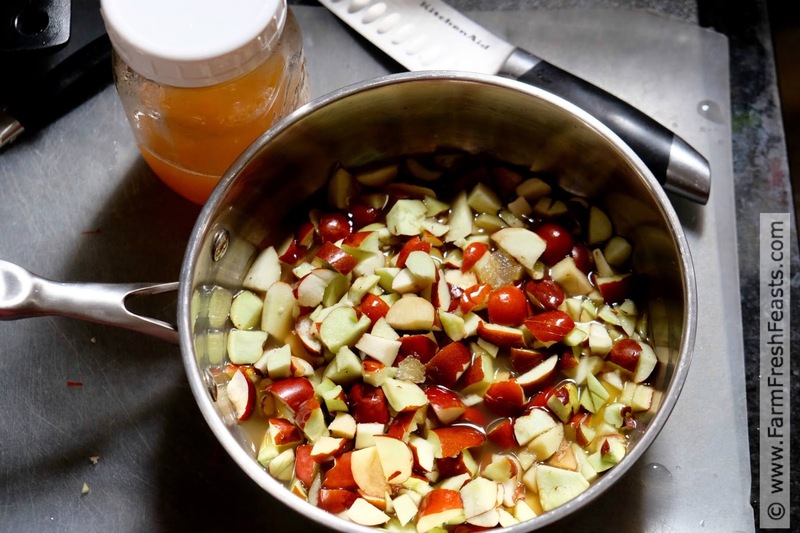 Bring to a boil, then reduce heat and simmer for 20 minutes until fruit is softened. Puree (I used my immersion blender) until reasonably smooth, small pieces of jujube skin are just fine. You'll have about 1 cup. Set aside. In a food processor with a metal blade (or mixing bowl with wooden spoon, your choice) combine oats, flour, sugar, baking powder and salt. Add in the butter and process or stir until dough comes together without dry patches. Remove half of the dough and reserve. Add in pecans to the remainder. Process to incorporate. Preheat the oven to 350 degrees Fahrenheit and grease pan (see Note above, I prefer 9x9 but you can also use the same amount of ingredients for a 9x13 pan). Pat the reserved (without nuts) dough into the bottom of the pan. 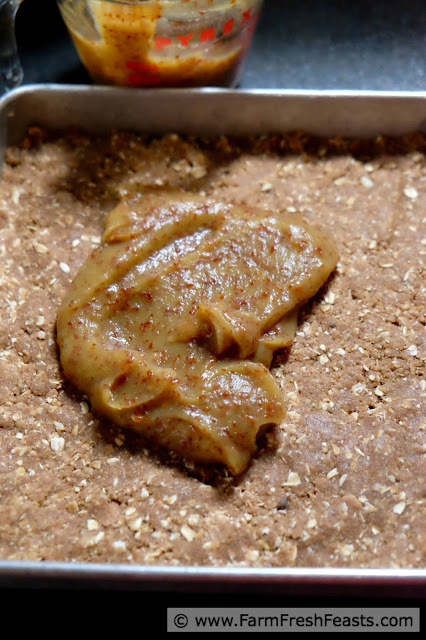 Spread jujube butter across dough. Top with remaining (with nuts) dough, spreading evenly over jujube butter and patting down. Bake for 20 to 30 minutes until top is lightly browned. Cool completely, and even chill for an hour before cutting for neater edges. Behind the scenes--I shoved all the mess into the sink to take the photos on the counter. Stay tuned--this is the first in a record FIVE sweet treats in a row, because on October 5th we kick off #Choctoberfest with a giveaway! There will be Killer S'mores Blondies, Chocolate Beet Crinkle Cookies, Leftover Halloween Candy Trail Mix, and Pumpkin Eggnog Chocolate Chip Waffles coming up! I think these bars sound divine and am excited to go plug my zipcode in to Barn2Door! I might lean toward the Meyer lemons personally, but pomegranates are easier to get here. I'm narrowing down my choices, and you're right--I've seen pomegranates around. When I get inspiration from produce I can really tap into my creativity in the kitchen. Looking at the fruit and then taking the dogs for a long walk to let my mind wander sure doesn't hurt either. more jujube! I am definitely intrigued, and these bars sound incredible! I know, I know, I'm all jujube all the time these days. I'll stop after this, though--for now! I'd never heard of jujube - and they are definitely not the Jujubes candy that used to get stuck in my teeth many moons ago. 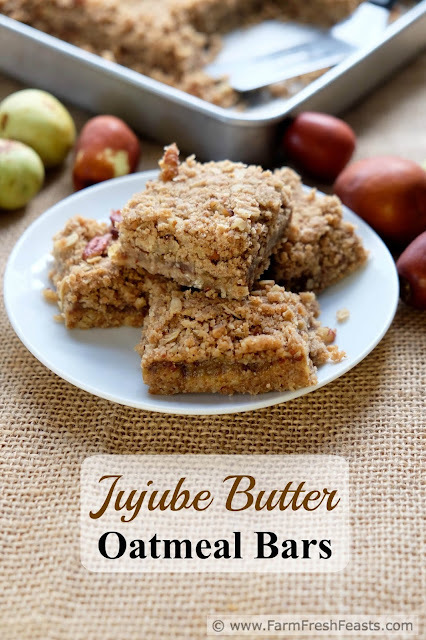 I love this type of bar cookie and your description of the jujube fruit makes me think I'd love it too. I have to say Junior Mints were my favorite movie theater candy, but I've seen the boxes of the other kind around.